I have a thing with opening paragraphs. Sometimes, I just can’t find the words, and spend far too long trying, stuck in a cycle of writing-deleting-rewriting. This post is one of those occasions. 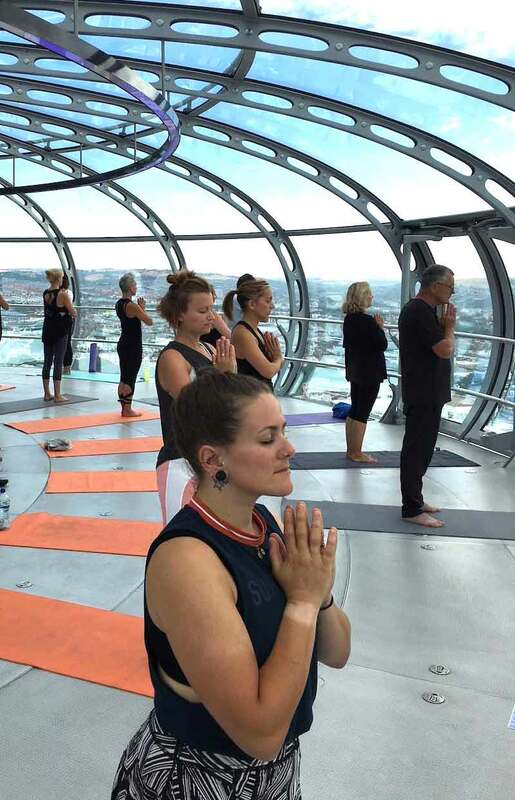 How do I find the words to explain how utterly amazing it was to do sun salutations 162m above the ground with panoramic views out to sea? How do I describe the smile that crept on my face as I lifted my arms to the sky and rose up towards the clouds with them? Is there a way to make whoever’s reading this know how invincible I felt in Warrior pose up there in that sky? Yesterday morning I experienced something really special. I mean, yoga always makes me feel pretty spesh to be fair, but every now and then it turns it up a notch to send me riding a wave so high it takes hours to come back down. 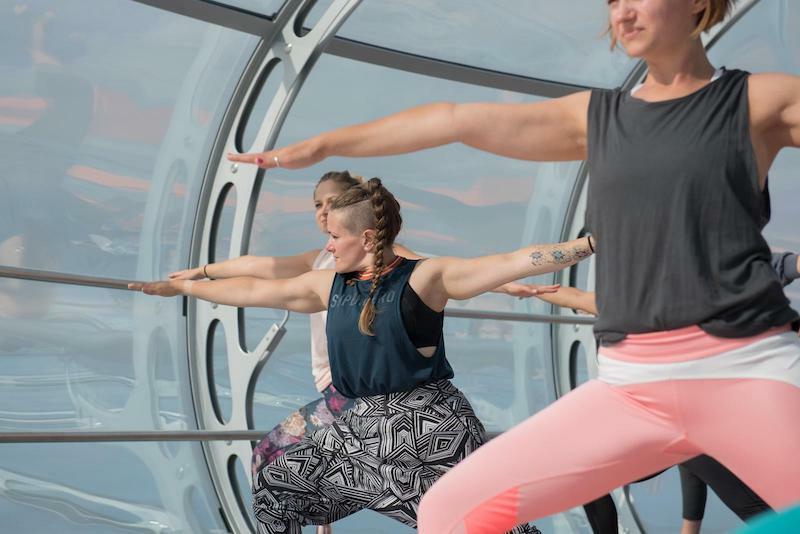 I took part in the first of a very special series of yoga events on the British Airways i360. Like many of my friends and other attendees at today’s session, I hadn’t been for a ‘flight’ until today, so was excited to see what it’s like. And what better way to experience it than a strong and blissful yoga practice?! For me, the location of my practice really drives how I feel. I can create more space in my body and mind if the studio I’m practicing in has that space to give me – and I mean that metaphorically as well as physically. Some of the best yoga sessions I’ve done have been outside, in a wide open space, like on the beach, with the sound of the waves crashing in and the sun on my back. Equally, I’ve had the most empowering sessions in tiny gorgeous Brighton yoga studios with roofs shaped like chapels. But never up in the clouds with sky high panoramic views of my beloved Brighton. 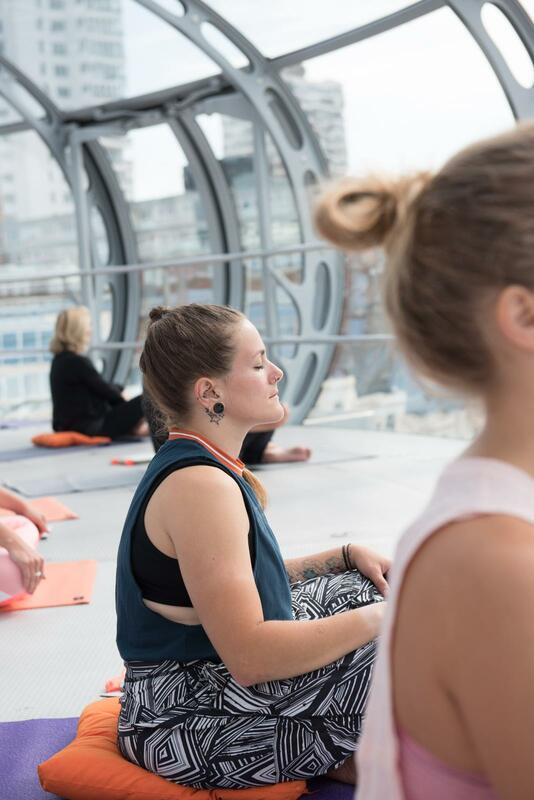 Escape to the Sky is a collaboration between Brighton yoga warriors MyEscape, Nine Lives Yoga and Holly Cooper Yoga, sponsored by Sweaty Betty Brighton, Positivitea and Yoga Clicks.These amazing sessions will be happening monthly starting August 25 (Bank Holiday weekend) and cost £25. 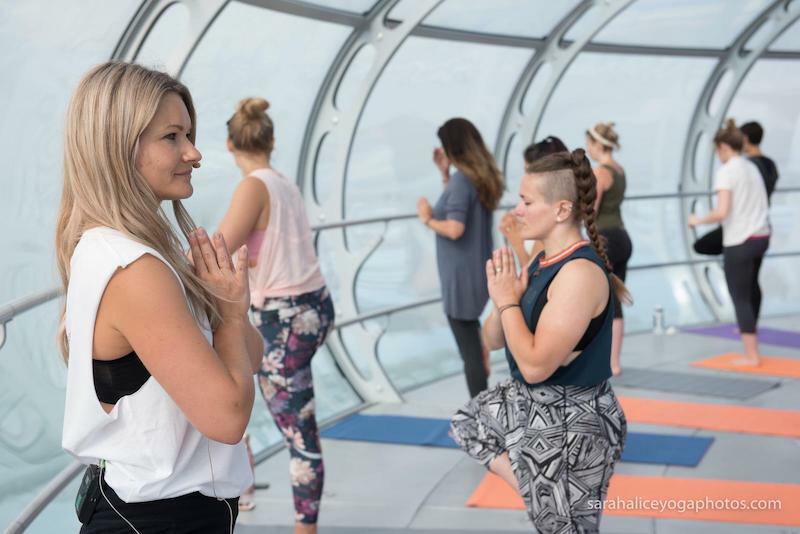 Along with the sky high yoga classes there’ll be brunch events and a series of special events including hen dos, yoga raves, day retreats and corporate wellbeing packages. That’s right, kids. YOGA RAVE. Sign me up! This is just what this city needs. There’s such an amazing wellbeing movement and community, with so much yoga, meditation and pilates classes in Brighton, but what was missing is this next-level experience. 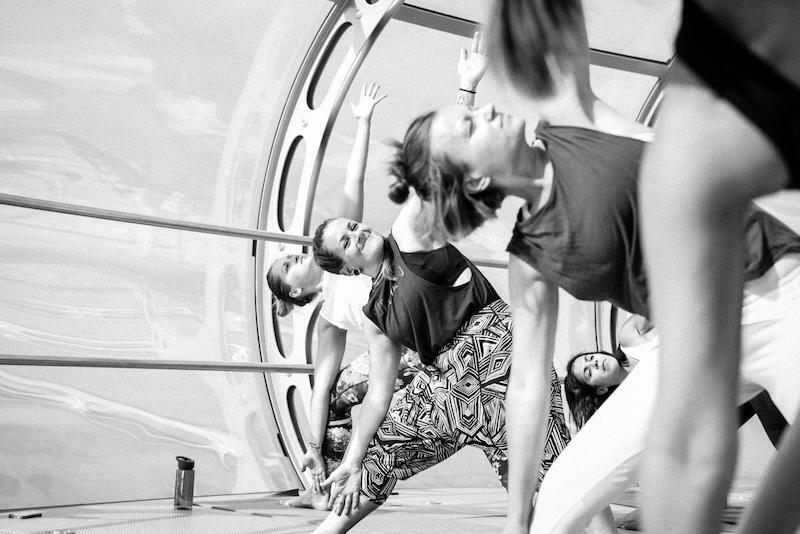 London, we see your rooftop yoga, and we raise you yoga in the sky! I honestly cannot describe to you the feeling of looking out to sea from that high up whilst immersed in my practice. Focusing on the glistening horizon and balancing so strong for Tree I could close my eyes and stay there. It really was an experience to remember and if you’re in Brighton – or visiting for the Bank Holiday – I urge you to come and get your feel good vibes right now! Sadly I can’t make it as I’ll be throwing myself down the mountain bike trails at Bike Park Wales but you can have my spot and I’ll see you for the September one! 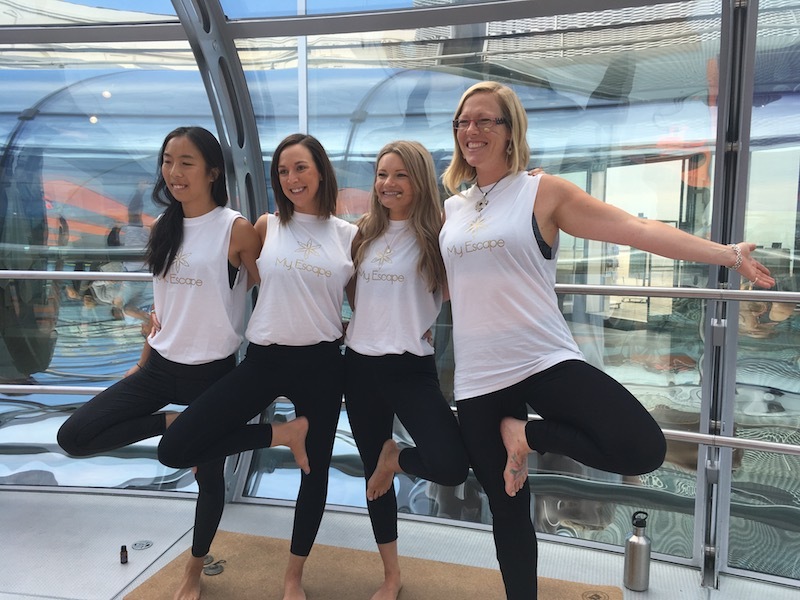 Sign up to the next Escape To The Sky, and follow MyEscape and Nine Lives Yoga on Facebook to stay up to date with news. Where’s the most amazing place you’ve ever practiced?